In terms of natural disasters, some strike in an instant without warning, like the earthquakes that struck Japan and New Zealand earlier this year. Now with advancements in technology, tsunamis and even tornadoes can be tracked with appropriate warnings to specific neighborhoods. However, tornadoes still manage to steal hamburgers even in this day and age. Some devastating natural disasters like droughts and floods are slow-moving, providing home owners and citizens time to prepare for what approaches. A year ago, Nashville was struck by once-in-a-lifetime flooding. This spring, the residents who live near the Ohio River and the Mississippi River are dealing with record-breaking rising waters. 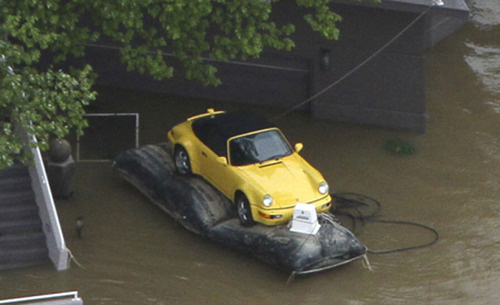 With advanced warning, one car lover used a creative solution to save his pet Porsche, not a gold Porsche nor a green Porsche, but the only “Fly Yellow” 1992 Porsche America Roadster in existence. Gizmodo has all the details on the car rescue and the collectible car.